As a financial advisor and expert, holder of a CPA, and former judicial expert to the Court of Cassation, René Riol created in 1987 Ricol Lasteyrie Corporate Finance with Jean-Charles de Lasteyrie and Gilles de Courcel. He chaired the Compagnie Nationale des Commissaires aux Comptes, the Conseil Supérieur de l’Ordre des Experts-Comptables, the Compagnie des Conseils et Experts Financiers and the International Federation of Accountants. 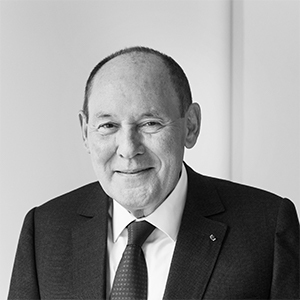 René Ricol exercised multiple public responsibilities: he chaired the Observatoire des Délais de Paiement, as well as the Business Creation, Advisory and Orientation Agency of France Investment. He also served as France’s national Credit Mediator and as Head of the Commissariat Général à l’Investissement. René is Grand Officer of the Legion of Honor, Grand Officer in the National Order and Merit and Commander of the Agricultural Order of Merit.